The Best Acoustic Bass Guitars in 2019: reviewed and rated right here! 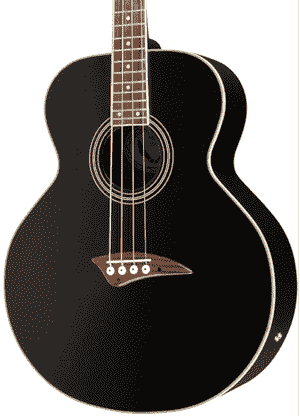 It’s easy to get some unplugged playing time with the best acoustic bass guitar. Whether you’re practicing, jamming or simply improvising on a lazy afternoon, having a bass you can play without an amp is a plus. We’ve picked out a few acoustic basses that will surely make your fingers itch to play them anytime, anywhere! These acoustic bass models are selected based on their sound quality, build quality and overall performance. These bass guitars also come from different price tiers, so no matter the size of your budget, you’ll surely find one or two that would suit your taste. Taylor GS Mini Acoustic Bass Guitar You won’t find a list of the best acoustic instruments without a Taylor guitar. For this list, we’re putting the Taylor GS Mini-e Acoustic-Electric Bass front and center because of its sound and overall appeal. It’s great for both quiet practice and stage performance as it’s already equipped with an ES-B pickup. You can really take this acoustic bass anywhere! 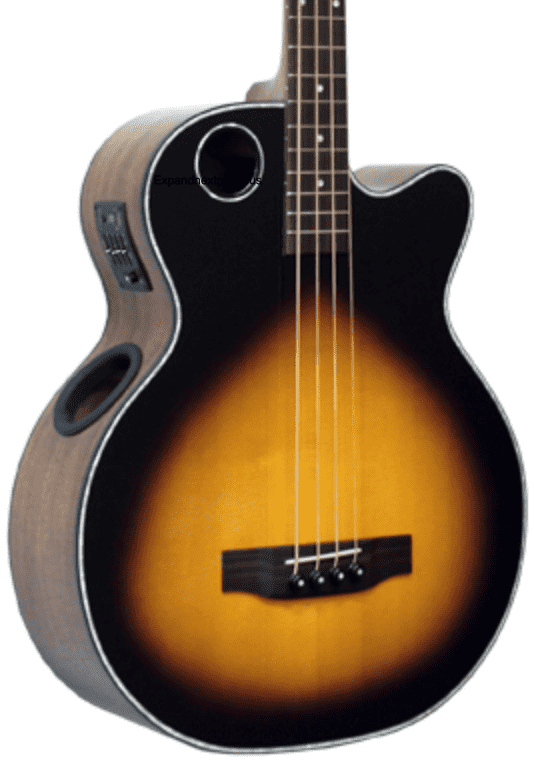 Ibanez AEB10E Acoustic Bass Guitar Ibanez also creates great acoustic instruments and for the bass player, it has the Ibanez AEB10E, an acoustic-electric bass that sounds awesome plugged or unplugged. Sporting a spruce top and mahogany back and sides, this bass delivers a well-balanced tone from the top end to the mids and bass. The Fishman Sonicore electronic system captures the sound seamlessly and efficiently. Dean EAB Acoustic Bass Guitar Dean is not as popular as Taylor or Ibanez but its EAB Acoustic-Electric Bass Guitar delivers some really tough competition as the best acoustic bass. The Dean EAB features a mahogany body with a spruce top, a mahogany neck and a passive preamp with treble and volume controls and an onboard tuner. What’s more, it also has a beginner-friendly price! Ibanez PCBE12MH Acoustic Bass Guitar Another pocket-friendly starter acoustic bass is the Ibanez PCBE12MH. 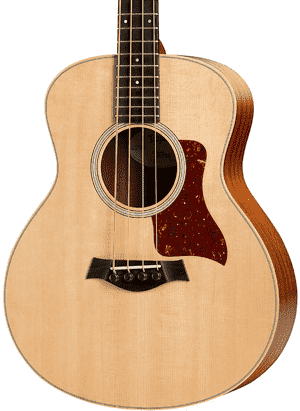 What makes this acoustic bass special is its Open Pore Natural finish, which not only enhances the natural beauty of the wood but also optimizes sound vibration, giving the guitar plenty of volume. For even greater projection, you can utilize the built-in pickup/preamp system, which also comes with a tuner. Boulder Creek EBR1-TB4 Acoustic Bass Guitar With its bold looks and top specs, the Boulder Creek EBR1-TB4 acoustic-electric bass is one premium instrument that’s worthy of your investment. What makes it different from the other acoustic basses on this list is its upward-facing soundhole, which lets you hear yourself easily even in a noisy environment. If you need more volume, just plug it into an amp! This acoustic bass packs a lot of punch for its size. The Taylor GS Mini-e Bass has a short scale length of 23.5 inches so it’s definitely more compact and portable and lightweight than a standard electric bass guitar. Despite its size, it’s extremely comfortable and fun to play. The condensed fret spacing also makes this acoustic bass a great instrument for beginners and players with small hands. This mini bass has a compact Grand Symphony body style and it’s fitted with custom nylon core strings wrapped with phosphor bronze wire. The strings are Taylor-made (see what we did there?) just for the GS Mini-e, so if you’re getting this bass you’d better stock up on the specially designed D’Addario strings as well. The Taylor GS Mini-e Bass features a Sitka spruce top and layered sapele back and sides. The tonewood combination yields a rich, crisp and punchy tone with a pronounced midrange. The 20-fret fingerboard is made of ebony, which adds a strong high-midrange and treble crispness. What’s more, the GS Mini-e is equipped with Taylor’s ES-B electronics. You have a pickup, onboard preamp with volume and tone controls as well as a digital chromatic tuner. The Ibanez AEB10E in Dark Violin Sunburst finish is a beauty and it sounds great, too. Indeed there’s a lot to love about this acoustic bass, including its sub-$500 price tag. First there’s the traditional, time-tested combination of spruce and mahogany for the body tonewoods. The spruce top produces a snappy top end to complement the robust mids and lows produced by the mahogany back and sides, delivering a well-balanced bass tone with highlight on the low mids. Then there’s the comfortable neck. The thin-profile neck is also mahogany and it’s topped with a smooth rosewood fingerboard with 22 frets. This acoustic bass also has a cutaway so you can access the upper frets more easily. Should you need to amplify your sound, the onboard Fishman Sonicore pickup system can help you do just that. Simply use the 1/4-inch or XLR output to connect the bass with any PA system, amp or recording setup, and you’re good to go! The Ibanez AEB10E also has an Ibanez AEQ-SST Shape Shifter preamp with a tuner that also functions as a mute switch. There’s also a three-band EQ, shape control knob (for reducing feedback) and a phase switch. The Dean EAB Acoustic-Electric Bass is without a doubt one of the best acoustic bass guitars you can get for under $300. If you’re a beginner, this is a fantastic instrument to get started on. 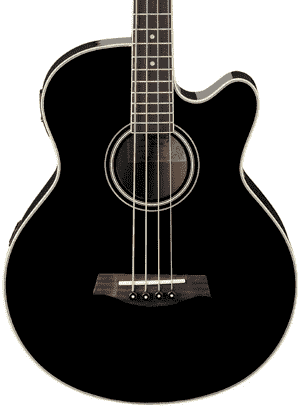 This acoustic-electric bass is comfortable and easy to play. It has a full 34-inch scale to give you a feel of how playing an electric bass can be like. Like the Ibanez AEB10E, the Dean EAB features a spruce top and mahogany back and sides. It’s a popular tonewood pairing because it works beautifully – the mahogany back and sides deliver that deep, full-bodied resonance while the spruce top yields a crisp-sounding tone with just the right bass bite. The neck of the Dean EAB acoustic-electric bass is also made of mahogany. It has a C-shaped profile and is topped with a smooth rosewood fretboard with pearl dot inlays for maximum playing comfort. With its natural finish that shows off its organic wood grain, this acoustic bass has a classic look about it as well. The EAB acoustic-electric bass is equipped with Dean’s DMT G03 preamp system with a built-in tuner and volume and tone controls. Its price puts the Ibanez PCBE12MH squarely within the realm of entry-level instruments, but its performance can make you think this acoustic bass should cost so much more. Priced at less than $300, the Ibanez PCBE12MH makes for a great starter instrument but pros can definitely have lots of fun playing it as well. The Ibanez PCBE12MH has a Grand Concert body style and sports an all-mahogany top, back and sides. The warm, rich tone of the mahogany is projected in full, thanks to the Open Pore Natural finish that lets the body of the acoustic bass vibrate freely. The maple neck, which also sports an Open Pore finish, is paired with a rosewood fingerboard with 20 frets. While the Ibanez PCBE12MH already has a good volume unplugged, the sound can be further amplified through the onboard electronic system. The Ibanez undersaddle pickup and AEQ-202T preamp are specially designed to respond to and tailor the frequencies of an acoustic bass guitar. There’s also a built-in tuner that you can use without having to plug the bass in. Other features of the Ibanez PCBE12MH include chrome die-cast tuning machines, Ibanez Advantage bridge pins, a rosewood bridge and a tortoiseshell rosette. Packed with premium specs, the Boulder Creek EBR1-TB4 is more than the usual acoustic bass guitar. It’s got two soundholes – a small one at the top in an off-center position and another at the upper side of the body. The extra soundhole at the side is oriented toward the player so you can easily hear what you’re playing. It’s a neat feature to have if you’re in a noisy environment! The Boulder Creek EBR1-TB4 acoustic bass features a solid spruce top, mahogany back and sides and a rosewood fingerboard with 21 frets. It also has a suspended bracing system, which allows the tone to resonate better and become more robust. All these features result in a crisp, bright and loud tone. 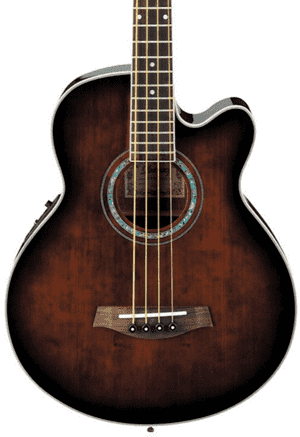 This acoustic bass has a jumbo body style with a cutaway for easier upper-fret access. It has a full scale of 34 inches, so if you already play a full-size electric bass, you’ll feel right at home with this acoustic. The Boulder Creek EBR1-TB4 comes with a pickup system installed. You can easily dial in your tonal preferences via the AB4-T preamp. There’s also a chromatic tuner onboard to help make tuning the acoustic bass faster and hassle-free. Why buy an acoustic bass guitar? We’ve given you five fantastic options to choose from when you’re out looking for the best acoustic bass guitar. But why buy one, really? What use does it have if you already own and play an electric bass guitar? There are several reasons why a bass player may want to have an acoustic bass. You yourself may have your own reasons, some of which may be discussed below. If you’re still trying to decide whether or not to buy one, take a look at the following benefits of playing an acoustic bass. It can be played unplugged. Practicing or jamming with an electric bass guitar can be fussy with cables and amps and the necessary power supply. In contrast, if you simply want to practice and warm up your fingers, you can do so in a jiffy with an acoustic bass, which doesn’t have to be plugged in for you to hear it. Acoustic basses, when unplugged, are best played in a quiet or intimate setting where there’s no loud background noise that can drown out the sound from the guitar. It’s great for acoustic gigs. Some gigs or sets call for an all-acoustic setup, in which case having an acoustic bass is a must. An acoustic bass has that woody, rich acoustic sound that many songs call for. For gigs, it’s recommended to plug in the bass into a bass amp so its low-frequency tones can be properly heard and appreciated. This is why most acoustic bass models come with a pickup-preamp system for amplification. It sounds different from an electric bass. Being hollow, an acoustic guitar produces a sound that’s vastly different from one that an electric guitar produces. As with six-string acoustic guitars, the combination of tonewoods in an acoustic bass contributes to the character of its sound. Acoustic basses have a deep, woody grumble that you can feel resonating through the guitar. It’s a sound that can’t be replicated playing an electric. Playing an acoustic bass can give you a warm, fuzzy feeling that will make you want to play more and more. Those interested in learning to play bass but can’t afford a complete electric bass setup just yet can get started on an acoustic bass. It has the same tuning so you can learn all the basics without having to buy an electric. It’s very handy for quiet practice, which as you know beginners need lots of. Since it’s also lighter, an acoustic bass is easier and more comfortable to play for beginners. You will feel less fatigued even after long practice sessions. It’s also easier to take along with you to lessons – just make sure you get a good case or gig bag for it. And once you’re able to buy an electric bass, transitioning will be easy. When you learn to play a riff on an acoustic bass guitar, you’ll have absolutely no trouble ripping it up on an electric bass guitar. It has the appeal of a classic acoustic guitar. Acoustic guitars have a certain homey appeal that many musicians find hard to resist. And like six-string acoustic guitars, acoustic bass guitars also come in a wide array of tonewood combinations, body styles and finishes. They are very nice to look at and even nicer to hear. Those are just some of the reasons why getting an acoustic bass guitar is a good idea for bass players. Did those convince you take the leap and buy one? If yes, then here’s a tip: To really get the most out of the best acoustic bass guitar you find, invest in a bass amp as well – you never know when you need to play louder!